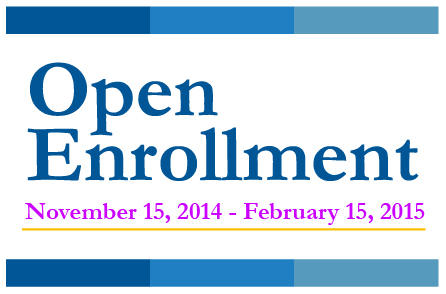 The Open Enrollment period for 2015 coverage is November 15, 2014 to February 15, 2015. If you haven’t enrolled in 2015 coverage by February 15, you generally can’t buy Marketplace health coverage for 2015 unless you qualify for a Special Enrollment Period. If you’re enrolled in a 2014 Marketplace plan, your coverage ends December 31, 2014. This is true no matter when your 2014 coverage began. To continue health coverage in 2015, you can renew your current health plan or choose a new plan through the Marketplace until February 15, 2015. If you want a new plan to start January 1, 2015, you must renew or change your plan by December 15, 2014. Learn about your 2015 options if you have 2014 coverage. If you need assistance with your healthcare coverage, contact me, I can help! Between the 1st and 15th days of the month, your coverage starts the first day of the next month. Between the 16th and the last day of the month, your coverage starts the first day of the second following month. So if you enroll on January 16, your coverage starts on March 1. Between February 1, 2015 and the deadline of February 15, 2015, your 2015 coverage begins March 1, 2015. You can enroll in Medicaid or the Children’s Health Insurance Program (CHIP) any time. If you own or operate a small business, you can start offering coverage to your employees any time. Contact me for a FREE GROUP QUOTE! If you don’t have health coverage during 2015, you may have to pay a penalty. The fee in 2015 is higher than it was for 2014 — 2% of your income or $325 per adult/$162.50 per child, whichever is more. Next Next post: Do You Qualify for Help Paying Your Health Insurance?